Take a trip to Perugia and drive around in a snazzy rental car and make your travel stories better. When pre-booking a rental car with us, you can choose from the widest variety of rental cars among various segments such as compact, sedan, SUV, luxury and more. We bring you car rental offers from the most reliable suppliers at the lowest prices so you can pick the best option after a detailed comparison between multiple deals. You can also opt for add-ons like navigation systems and extra child seats for a minimal surcharge to add more comfort in your journey. Our booking support team is available 24x7 to assist you in case you need any help booking online. So hire a car in Perugia with us and make the most of your time in the beautiful city. Perugia, the capital city of Umbria, is crisscrossed by the River Tiber and is a lively and energetic city. Perugia is often called the 'universities town' as it houses quite a few important universities and academic colleges and institutes with thousands of students. 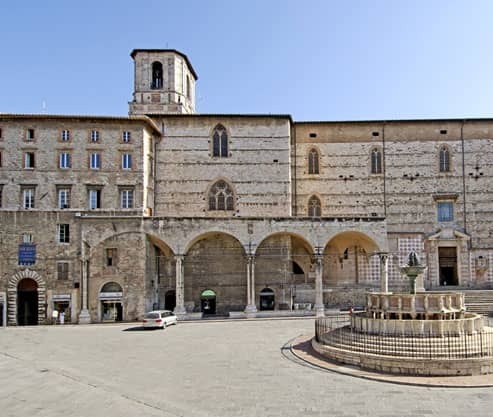 The city is also culturally significant and hosts a number of important annual festivals like the Eurochocolate Festival, the International Journalism Festival, and the Umbria Jazz Festival. Perugia experiences mild climate all throughout the year and extreme temperatures are uncommon. A large number of students has also given rise to the number of cafes and bars and the nightlife in the city is ever growing. This place is a collection of Italian national paintings in the Palazzo dei Priori. The collection is spread over 40 galleries in the Palazzo and consists of the finest collection of the Umbrian School of Painting from the 13th to the 19th century. Some of the famous featured artists here are Perugino, Pinturicchio, Benedetto Bonfigli, Bartolomeo Caporali, di Cambio and di Duccio. This Roman Catholic cathedral in Perugia is dedicated to Saint Lawrence. The place finished building in 1490 and is made up of white and pink marble lozenges. The cathedral also has a museum that has precious artworks, sculptures, and manuscripts from the time around the 10th century. The centre of attraction in Perugia, this is a medieval monumental fountain located between the Perugia Cathedral and the Palazzo dei Priori. The fountain was built in the 1200s and designed by Nicola Pisano and Giovanni Pisano. There are 25 sides of the fountain and each side has a sculpture that represents prophets, saints, labors, zodiac signs and events from the Roman history.